The A1 will be expanded to more markets including China and possibly the U.S.
PARIS -- Audi is considering selling its next-generation A1 compact car in the United States to capitalize on consumer interest in small cars and hedge against fluctuations in fuel prices. "Consumers are asking for small cars, and there is the likelihood that the second generation of the A1 will come to the U.S.," Peter Schwarzenbauer, Audi AG's board member for sales and marketing, said last week during an interview on the sidelines of the Paris auto show. Although a final decision won't be made for 18 months, Schwarzenbauer said the likelihood is "quite high" that Audi would import the pint-sized two-door car. "We have plenty of time to see how the segment is developing," he said. Schwarzenbauer said Audi's board decided several years ago not to import the A1 when fuel prices were low and consumer sentiment for small cars wasn't as strong. But recent sales of the A3 hatchback and diesel engines have shown that consumers will consider smaller vehicles and alternative engines. "With the A1, the same thing could happen" with consumers, he said. The A1 was originally built to sell only in Europe but will be expanded to more markets in the next few years, including China after 2011. It went on sale in August in Europe and competes with BMW's 1 series and Daimler AG's Mercedes-Benz A class. 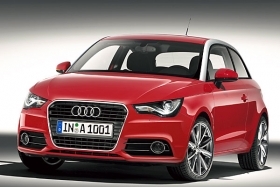 The A1 starts at 15,800 euros (about $21,500) in Germany. Audi decided to expand sales of the A1 after a Web site the automaker set up for the car attracted more than 150,000 interested customers around the world, Schwarzenbauer said. "We will expand our production capacities by 20 percent" for the A1, he said in an interview this year. Audi initially pledged to produce about 100,000 A1s annually at its Brussels factory. Audi, which is targeting record sales of more than 1.08 million vehicles this year, has a goal of dethroning BMW as the world's largest maker of luxury cars by 2015, when it wants to reach annual sales of 1.5 million.